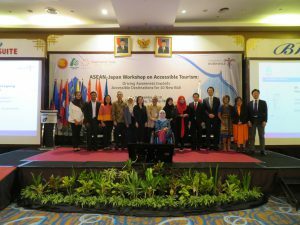 ASEAN-Japan Centre organized “ASEAN-Japan Workshop on Accessible Tourism” in Tanjung Pandan, Indonesia to promote accessible tourism. The workshop was co-organized with the Ministry of Tourism of Indonesia by inviting tourism stakeholders from Indonesia as well as from other ASEAN Member States. The theme was picked up in line with the discussion at the 21st Meeting of ASEAN Tourism Ministers that ASEAN needed to further progress the inclusive tourism in the region. The AJC dispatched two experts from Japan who made presentations on a case study of accessible tourism in a beach in Japan, introduction of tour products for people with disabilities along with the key points to be considered for operation. 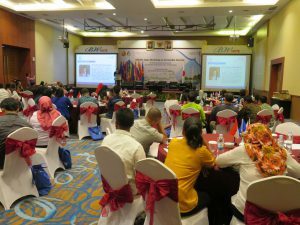 The speakers from Indonesia introduced one of Indonesia’s tourism policies, “10 New Bali”, and representatives from research institute, university, barrier free organization, travel agency that conduct barrier free tours and tourist facilities made presentations and actively exchanged ideas. Mr. Hisashi Yamaguchi, President, TIC Travel Center Co., Ltd.